On September 8th, 2011, an art exhibit of children's drawings was banned by the Museum of Children's Art in Oakland (MOCHA). Much of the artwork was drawn by children participating in MECA's "Let the Children Play And Heal" Project. "Let the Children Play and Heal" gives tens of thousands of children and youth in Gaza opportunities to express themselves though art, dance, music, story-telling, theater and puppetry; to get support from the larger community; and to have fun and just be children. It was developed to address the needs of traumatized children after the 2009 assault on Gaza. 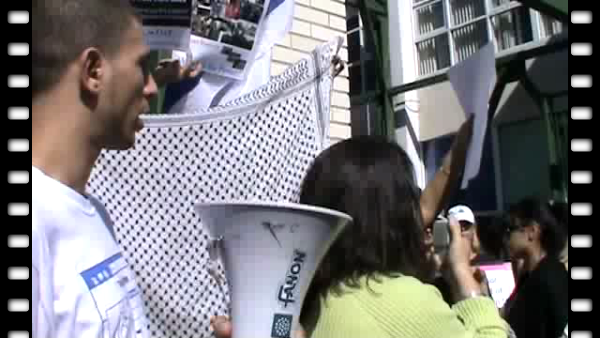 Zionist organizations such as the Jewish Community Relations Council and Jewish Federation are suspected of having intimidated MOCHA into canceling the show, in order to deny an audience for the perspectives of Palestinians, despite the fact that MECA had been working with the museum for months planning the local exhibit. On September 23rd, a demonstration was held in front of MOCHA to protest the censorship. While the exhibit is looking for a longer lasting Bay Area venue at this point, the Opening Reception will go on as planned on September 24th, outside rather than inside of MOCHA. §Leading the crowd in a chant - "MOCHA MOCHA have a heart, let us see the children's art"